The Centre de Lamairé (commune of St Loup-Lamairé) is equipped to receive up to 52 people. It is approved, too, for the reception of 40 maternal and is equipped for the stay of the handicapped people. Internet access (if you bring your PC). From April to October the capacity can be increased to 70 people with trailer sleeping. 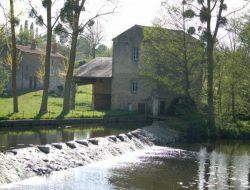 Christian and Dany, rural actors, welcome you in the former mill of the 17th century, renewed in 2 holiday cottages, independent, for 4 to 5 persons, in a family atmosphere. We shall make you discover the surrounding nature and the work of the farmers breeders. Holiday cottage for up to 7 people, close to the Vendée and the gates of Puy du Fou. At the edge of the Sèvre Nantaise 2 km from Moncoutant, this cottage classified 3 stars, is ideally placed to discover the region and also the Marais Poitevin and the Futuroscope. Holiday village situated at the heart of the region Poitou-Charentes between Puy du Fou, the Futuroscope and Marais Poitevin, the residence Natura Resort Pescalis proposes you a set of chalets implanted at the heart of the 1st Natural European Center of Fishing (of which 100ha of lakes).